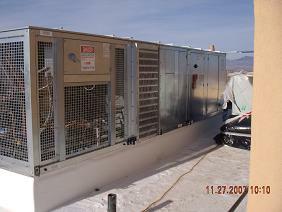 As the owner of the Buffalo Thunder casino discovered, the Applied Air FAP, packaged Dedicated Outdoor Air System, has one of the lowest overall unit heights in the industry. This reduces or eliminates the need for roof mounted parapets that can be extremely expensive. The FAP has also been tested by ETL and shown to have up to a 100:1 heating turndown ratio...the best in the industry...for much tighter temperature control and lower energy costs. Adding the optional digital scroll compressor to the standard DDC control package and the result is a system that saves the owner money year-round.